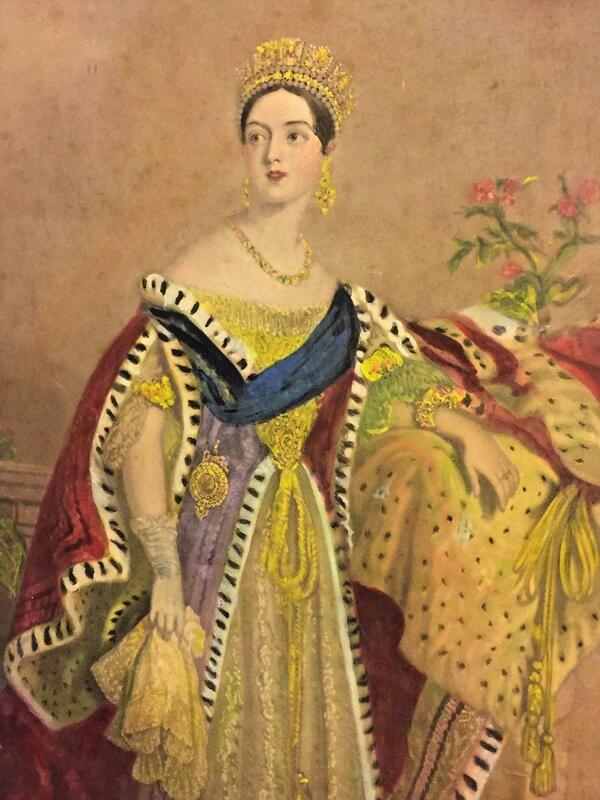 On February 10, 1840, Her Majesty Alexandrina Victoria — Queen of the United Kingdom of Great Britain and Ireland — married her first cousin, Francis Albert Augustus Charles Emmanuel — Prince of Saxe-Coburg and Gotha. They were each 20 years old at the time with Queen Victoria three months older than Prince Albert. For her wedding — held at St. James’s Palace in the City of Westminster — Victoria selected a white dress, which was considered an unusual choice at a time when colors were more usual, made from heavy silk satin. The Honiton lace used for her wedding dress proved an important boost to Devon lace-making. Queen Victoria has been credited with starting the tradition of white weddings and white bridal gowns, although she was not the first royal to be married in white. Victoria was born on May 24, 1819, the daughter of Prince Edward, Duke of Kent and Strathearn, the fourth son of King George III. Both the Duke of Kent and King George III died in 1820, and Victoria was raised under close supervision by her German-born mother, Princess Victoria of Saxe-Coburg-Saalfeld. She inherited the throne on June 12, 1837, at the age of 18 after her father’s three elder brothers had all died leaving no surviving legitimate children. The United Kingdom was already an established constitutional monarchy in which the sovereign held relatively little direct political power. Privately, Victoria attempted to influence government policy and ministerial appointments; publicly, she became a national icon who was identified with strict standards of personal morality. Albert was born on August 26, 1819, in the Saxon duchy of Saxe-Coburg-Saalfeld, to a family connected to many of Europe’s ruling monarchs. Victoria and Albert’s nine children married into royal and noble families across the continent, tying them together and earning her the sobriquet “the grandmother of Europe”. Initially, Albert felt constrained by his role of consort, which did not afford him power or responsibilities. He gradually developed a reputation for supporting public causes, such as educational reform and the abolition of slavery worldwide, and was entrusted with running the Queen’s household, office and estates. He was heavily involved with the organization of the Great Exhibition of 1851, which was a resounding success. Victoria came to depend more and more on his support and guidance. He aided the development of Britain’s constitutional monarchy by persuading his wife to be less partisan in her dealings with Parliament — although he actively disagreed with the interventionist foreign policy pursued during Lord Palmerston’s tenure as Foreign Secretary. In 1857, Albert was given the formal title of Prince Consort. Albert died on December 14, 1861, at the relatively young age of 42, plunging the Queen into deep mourning and avoided public appearances. As a result of Victoria’s seclusion, republicanism temporarily gained strength, but in the latter half of her reign her popularity recovered. Her Golden and Diamond Jubilees were times of public celebration. Queen Victoria’s reign of 63 years and seven months was longer than that of any of her predecessors, and is known as the Victorian era. 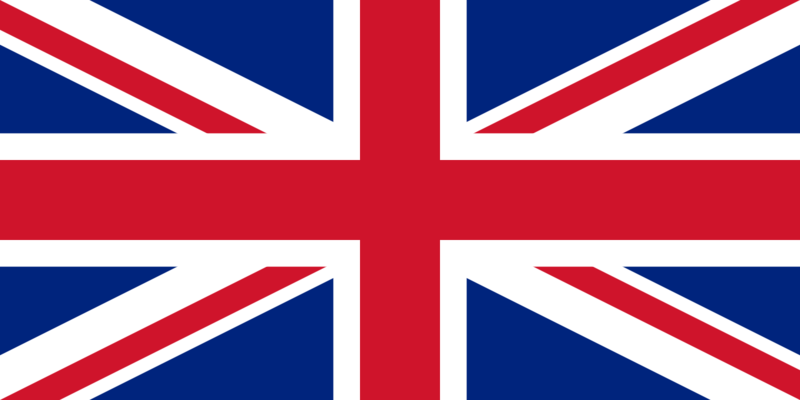 It was a period of industrial, cultural, political, scientific, and military change within the United Kingdom, and was marked by a great expansion of the British Empire. She was the last British monarch of the House of Hanover. On her death on January 22, 1901, their eldest son succeeded as Edward VII, the first British monarch of the House of Saxe-Coburg and Gotha, named after the ducal house to which Albert belonged. 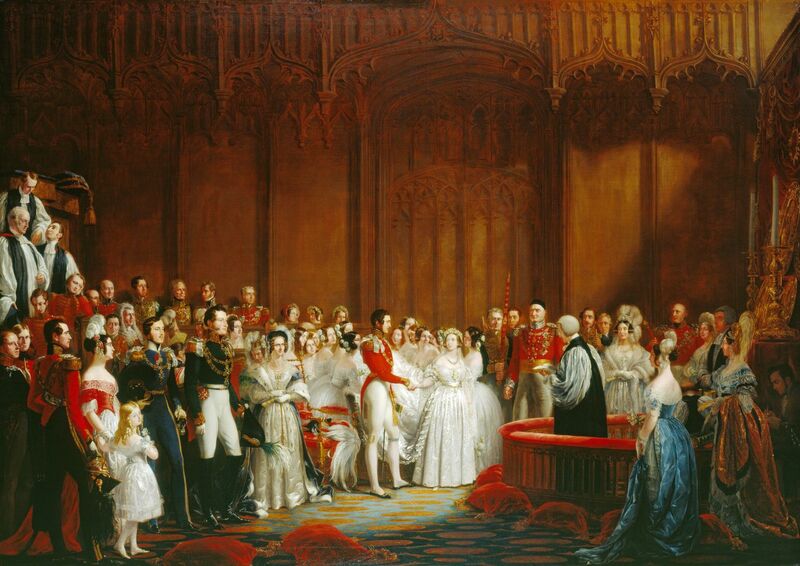 The Marriage of Queen Victoria and Prince Albert on February 10, 1840, painted by George Hayter. 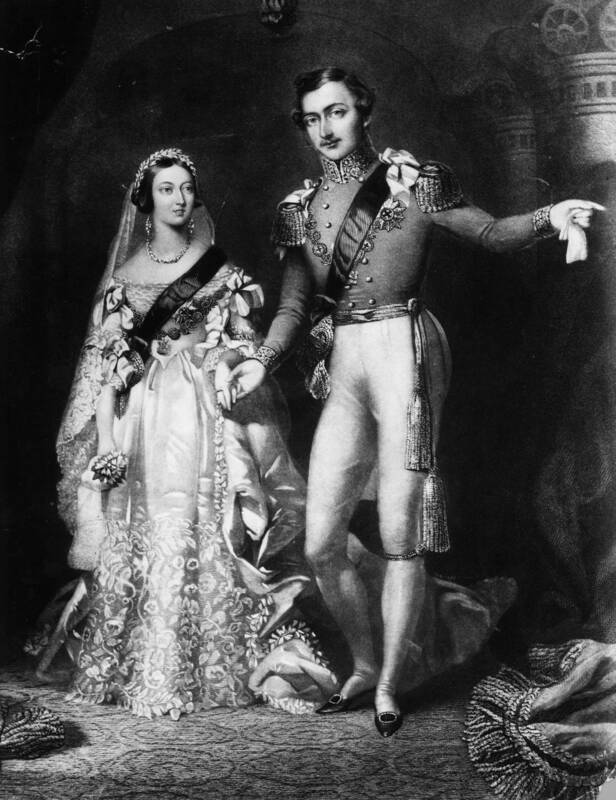 The idea of marriage between Albert and his cousin, Victoria, was first documented in an 1821 letter from his paternal grandmother, the Dowager Duchess of Saxe-Coburg-Saalfeld, who said that he was “the pendant to the pretty cousin”. By 1836, this idea had also arisen in the mind of their ambitious uncle Leopold, who had been King of the Belgians since 1831. At this time, Victoria was the heir presumptive to the British throne. Her father, Prince Edward, Duke of Kent and Strathearn, the fourth son of King George III, had died when she was a baby, and her elderly uncle, King William IV, had no legitimate children. Her mother, the Duchess of Kent, was the sister of both Albert’s father — the Duke of Saxe-Coburg and Gotha — and King Leopold. Leopold arranged for his sister, Victoria’s mother, to invite the Duke of Saxe-Coburg and Gotha and his two sons to visit her in May 1836, with the purpose of meeting Victoria. William IV, however, disapproved of any match with the Coburgs, and instead favored the suit of Prince Alexander, second son of the Prince of Orange. Victoria was well aware of the various matrimonial plans and critically appraised a parade of eligible princes. She wrote, “[Albert] is extremely handsome; his hair is about the same colour as mine; his eyes are large and blue, and he has a beautiful nose and a very sweet mouth with fine teeth; but the charm of his countenance is his expression, which is most delightful.” Alexander, on the other hand, she described as “very plain”. Victoria wrote to her uncle Leopold to thank him “for the prospect of great happiness you have contributed to give me, in the person of dear Albert … He possesses every quality that could be desired to render me perfectly happy.” Although the parties did not undertake a formal engagement, both the family and their retainers widely assumed that the match would take place. Victoria came to the throne aged eighteen in June 1837. Victoria’s coronation took place on June 28, 1838, at Westminster Abbey. Over 400,000 visitors came to London for the celebrations. She became the first sovereign to take up residence at Buckingham Palace and inherited the revenues of the duchies of Lancaster and Cornwall as well as being granted a civil list allowance of £385,000 per year. Financially prudent, she paid off her father’s debts. Engraving of Queen Victoria by Henry Sadd of New York in 1847, based upon a painting done by Alfred Edward Chalon in 1837. Chalon’s painting of Victoria in her State robes going to the House of Lords for her first official act, the prorogation of the Parliament, on July 17, 1837. was engraved by Samuel Cousins and distributed to the public the day of Victoria’s coronation, June 28, 1838. The Queen’s letters of the time show interest in Albert’s education for the role he would have to play, although she resisted attempts to rush her into marriage. In the winter of 1838–1839, the prince visited Italy, accompanied by the Coburg family’s confidential adviser, Baron Stockmar. Albert returned to the United Kingdom with Ernest in October 1839 to visit the Queen, with the objective of settling the marriage. Albert and Victoria felt mutual affection and the Queen proposed to him on October 15, 1839, just five days after he had arrived at Windsor. Victoria’s intention to marry was declared formally to the Privy Council on November 23. The Queen ordered a bridal dress in Honiton lace, a type of bobbin lace made in Honiton, Devon. Historical Honiton lace designs focused on scrollwork and depictions of natural objects such as flowers and leaves. Its ornate sprigs or motifs, complex patterns were created separately and then sewn into the net ground of the piece. Common sprigs include daisies, roses, shamrocks, ivy leaves, butterflies, lilies, camellias, convolvulus, poppies, briony, antwerp diamonds, trefoils, ferns, and acorns. The lace was designed by William Dyce, head of the then Government School of Design (later known as the Royal College of Art), and mounted on a white satin dress made by Mary Bettans. The plain, cream-colored satin gown was made from fabric woven in Spitalfields, east London, and trimmed with a deep flounce and trimmings of lace hand-made in Honiton and Beer, in Devon. This demonstrated support for English industry, particularly the cottage industry for lace. The handmade lace motifs were appliquéd onto cotton machine-made net. Orange flower blossoms, a symbol of fertility, also trimmed the dress and made up Victoria’s wreath, which she wore instead of a tiara over her veil. The veil, which matched the flounce of the dress, was four yards in length and 0.75 yards wide. Her jewelry consisted of diamond earrings and necklace, and a sapphire brooch given to her by Albert. The slippers she wore matched the white color of the dress. 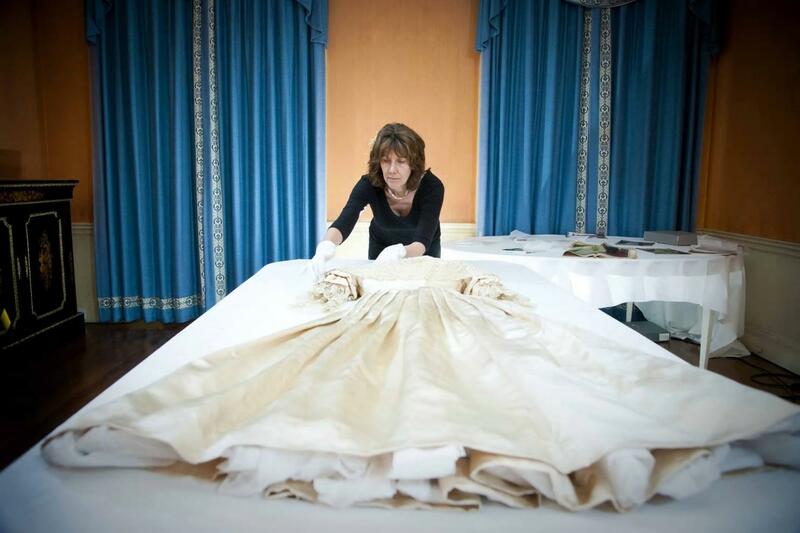 The train of the dress, carried by her bridesmaids, measured 18 feet (5.5 m) long. Queen Victoria and Prince Albert on their return from the marriage service at St James’s Palace, London, February 10, 1840. Engraved by S Reynolds after F Lock. The couple married on February 10, 1840, at the Chapel Royal, St James’s Palace, the most senior royal palace in the United Kingdom. Located in the City of Westminster, although no longer the principal residence of the monarch, it is the ceremonial meeting place of the Accession Council and the London residence of several minor members of the royal family. Built by King Henry VIII on the site of a leper hospital dedicated to Saint James the Less, the palace was secondary in importance to the Palace of Whitehall for most Tudor and Stuart monarchs. The palace increased in importance during the reigns of the early Georgian monarchy, but was displaced by Buckingham Palace in the late-18th and early-19th centuries. After decades of being used increasingly for only formal occasions, the move was formalized by Victoria in 1837. 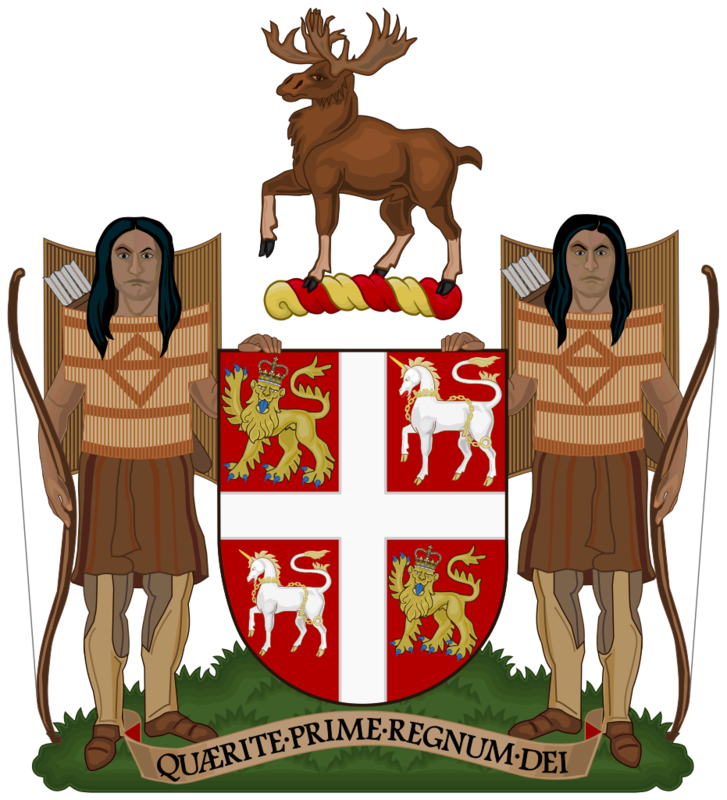 Today, the palace houses a number of official offices, societies and collections and all ambassadors and high commissioners to the United Kingdom are still accredited to the Court of St James’s. Located in the main block of St James’s Palace, the Chapel Royal was built circa 1540 and altered since, most notably by Sir Robert Smirke in 1837. The large window to the right of the palace gatehouse is in the north wall of this chapel which is laid out on a north-south rather than the usual east-west axis. Its ceiling richly decorated with royal initials and coats of arms is said to have been painted by Holbein. I NEVER, NEVER spent such an evening!!! MY DEAREST DEAREST DEAR Albert … his excessive love & affection gave me feelings of heavenly love & happiness I never could have hoped to have felt before! He clasped me in his arms, & we kissed each other again & again! His beauty, his sweetness & gentleness – really how can I ever be thankful enough to have such a Husband! … to be called by names of tenderness, I have never yet heard used to me before – was bliss beyond belief! Oh! This was the happiest day of my life! Because of Queen Victoria’s wedding dress, handmade lacework had a resurgence in popularity in the 19th century. Wearing white was quickly adopted by wealthy, fashionable brides. The Godey’s Lady’s Book, commenting about a decade after Victoria’s wedding, wrote: “Custom has decided, from the earliest ages, that white is the most fitting hue, whatever may be the material. It is an emblem of the purity and innocence of girlhood, and the unsullied heart she now yields to the chosen one”, even though white had been a distinctly uncommon choice for bridal gowns before Victoria’s wedding and was not chosen by a majority of brides until decades later. Following the 2011 wedding of Prince William and Catherine Middleton, comparisons were drawn between the bride’s white wedding dress and Queen Victoria’s own. While photography existed in 1840, the techniques were not yet fully developed. A series of photographs taken by Roger Fenton on May 11, 1854 of Victoria and Albert are often described as wedding or reenactment photographs, with the dress identified as her wedding dress. The Royal Collection has refuted these interpretations, stating that the images are the first photographs to show Victoria as a queen, rather than as a wife or mother, and that she and Albert are wearing court dress. Portrait painted by Franz Xaver Winterhalter, 1847, as an anniversary present for Prince Albert. Albert became an important political adviser as well as the Queen’s companion, replacing Lord Melbourne as the dominant, influential figure in the first half of her life. Victoria’s mother was evicted from the palace, to Ingestre House in Belgrave Square. After the death of Victoria’s aunt, Princess Augusta, in 1840, Victoria’s mother was given both Clarence and Frogmore Houses. Through Albert’s mediation, relations between mother and daughter slowly improved. Initially, Albert was not popular with the British public; he was perceived to be from an impoverished and undistinguished minor state, barely larger than a small English county. The British Prime Minister, Lord Melbourne, advised the Queen against granting her husband the title of “King Consort”; Parliament also objected to Albert being created a peer — partly because of anti-German sentiment and a desire to exclude Albert from any political role. Albert’s religious views provided a small amount of controversy when the marriage was debated in Parliament: although as a member of the Lutheran Evangelical Church Albert was a Protestant, the non-Episcopal nature of his church was considered worrisome. Of greater concern, however, was that some of Albert’s family were Roman Catholic. Melbourne led a minority government and the opposition took advantage of the marriage to weaken his position further. They opposed the ennoblement of Albert and granted him a smaller annuity than previous consorts, £30,000 instead of the usual £50,000. Albert claimed that he had no need of a British peerage, writing: “It would almost be a step downwards, for as a Duke of Saxony, I feel myself much higher than a Duke of York or Kent.” For the next seventeen years, Albert was formally titled “HRH Prince Albert” until, on June 25, 1857, Victoria formally granted him the title Prince Consort. Within two months of the marriage, Victoria was pregnant. Albert started to take on public roles; he became President of the Society for the Extinction of Slavery (slavery had already been abolished throughout the British Empire, but was still lawful in places such as the United States and the colonies of France); and helped Victoria privately with her government paperwork. In June 1840, while on a public carriage ride, Albert and the pregnant Victoria were shot at by Edward Oxford, who was later judged insane. Neither Albert nor Victoria was hurt and Albert was praised in the newspapers for his courage and coolness during the attack. Albert was gaining public support as well as political influence, which showed itself practically when, in August, Parliament passed the Regency Act 1840 to designate him regent in the event of Victoria’s death before their child reached the age of majority. Their first child, Victoria, named after her mother, was born in November. Eight other children would follow over the next seventeen years. All nine children survived to adulthood, a fact which biographer Hermione Hobhouse credited to Albert’s “enlightened influence” on the healthy running of the nursery. 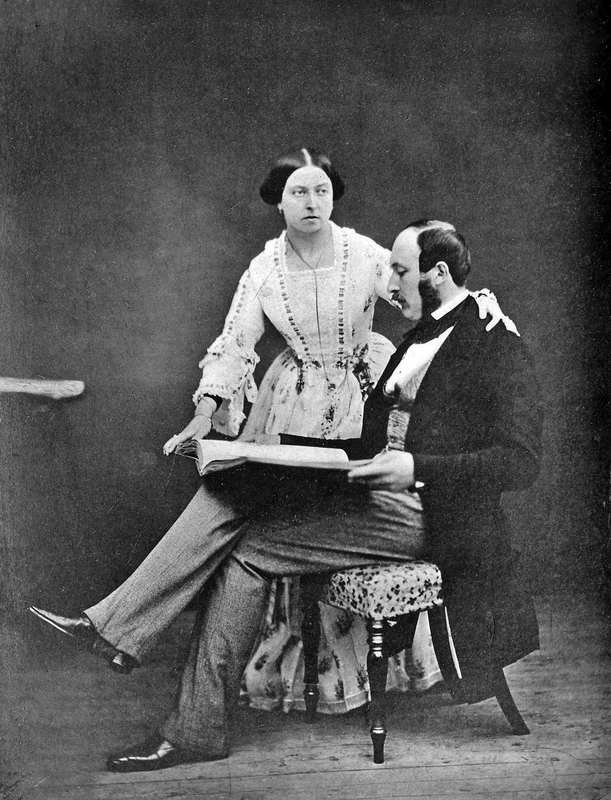 Queen Victoria and Prince Albert in 1854. Albert was seriously ill with stomach cramps in August 1859. During a trip to Coburg in the autumn of 1860, he was driving alone in a carriage drawn by four horses that suddenly bolted. As the horses continued to gallop toward a stationary wagon waiting at a railway crossing, Albert jumped for his life from the carriage. One of the horses was killed in the collision, and Albert was badly shaken, though his only physical injuries were cuts and bruises. He told his brother and eldest daughter that he sensed his time had come. In March 1861, Victoria’s mother and Albert’s aunt, the Duchess of Kent, died and Victoria was grief-stricken; Albert took on most of the Queen’s duties, despite being ill himself with chronic stomach trouble. The last public event he presided over was the opening of the Royal Horticultural Gardens on 5 June 1861. In August, Victoria and Albert visited the Curragh Camp, Ireland, where the Prince of Wales was doing army service. At the Curragh, the Prince of Wales was introduced, by his fellow officers, to Nellie Clifden, an Irish actress. By November, Victoria and Albert had returned to Windsor, and the Prince of Wales had returned to Cambridge, where he was a student. Two of Albert’s cousins, King Pedro V and Prince Ferdinand of Portugal, died of typhoid fever. On top of this news, Albert was informed that gossip was spreading in gentlemen’s clubs and the foreign press that the Prince of Wales was still involved with Nellie Clifden. Albert and Victoria were horrified by their son’s indiscretion, and feared blackmail, scandal or pregnancy. Although Albert was ill and at a low ebb, he travelled to Cambridge to see the Prince of Wales on November 25 to discuss his son’s indiscreet affair. In his final weeks Albert suffered from pains in his back and legs. When the Trent Affair — the forcible removal of Confederate envoys from a British ship by Union forces during the American Civil War — threatened war between the United States and Britain, Albert was gravely ill but intervened to soften the British diplomatic response. On December 9, one of Albert’s doctors, William Jenner, diagnosed typhoid fever. Albert died at 10:50 p.m. on December 14, 1861, in the Blue Room at Windsor Castle, in the presence of the Queen and five of their nine children. The contemporary diagnosis was typhoid fever, but modern writers have pointed out that Albert was ill for at least two years before his death, which may indicate that a chronic disease, such as Crohn’s disease, renal failure, or abdominal cancer, was the cause of death. The Queen’s grief was overwhelming. She blamed her husband’s death on worry over the Prince of Wales’s philandering. He had been “killed by that dreadful business”, she said. The tepid feelings the public had felt previously for Albert were replaced by sympathy. Albert’s rooms in all his houses were kept as they had been, even with hot water brought in the morning and linen and towels changed daily. Such practices were not uncommon in the houses of the very rich. Victoria entered a state of mourning and wore black for the remainder of her life. She avoided public appearances, and rarely set foot in London in the following years. Her seclusion earned her the nickname “widow of Windsor”. Through the 1860s, Victoria relied increasingly on a manservant from Scotland, John Brown. Slanderous rumors of a romantic connection and even a secret marriage appeared in print, and the Queen was referred to as “Mrs. Brown”. The story of their relationship was the subject of the 1997 movie Mrs. Brown. A painting by Sir Edwin Henry Landseer depicting the Queen with Brown was exhibited at the Royal Academy. Victoria published a book, Leaves from the Journal of Our Life in the Highlands, which featured Brown prominently and in which the Queen praised him highly. 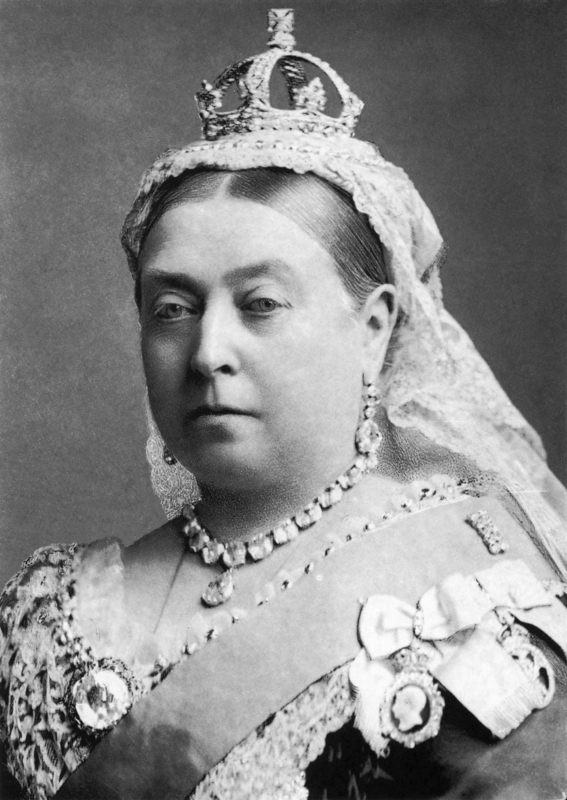 On March 17, 1883, she fell down some stairs at Windsor, which left her lame until July; she never fully recovered and was plagued with rheumatism thereafter. Brown died ten days after her accident, and to the consternation of her private secretary, Sir Henry Ponsonby, Victoria began work on a eulogistic biography of Brown. Ponsonby and Randall Davidson, Dean of Windsor, who had both seen early drafts, advised Victoria against publication, on the grounds that it would stoke the rumors of a love affair. The manuscript was destroyed. In early 1884, Victoria did publish More Leaves from a Journal of a Life in the Highlands, a sequel to her earlier book, which she dedicated to her “devoted personal attendant and faithful friend John Brown”. On the day after the first anniversary of Brown’s death, Victoria was informed by telegram that her youngest son, Leopold, had died in Cannes. He was “the dearest of my dear sons”, she lamented. 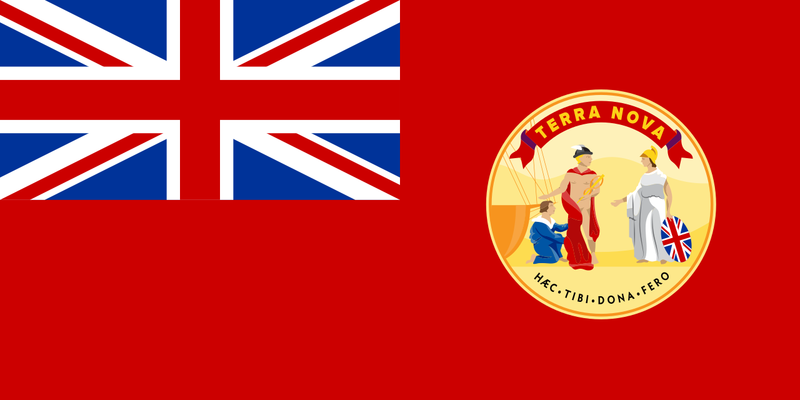 In 1887, the British Empire celebrated Victoria’s Golden Jubilee. Victoria marked the fiftieth anniversary of her accession on 20 June with a banquet to which 50 kings and princes were invited. The following day, she participated in a procession and attended a thanksgiving service in Westminster Abbey. By this time, Victoria was once again extremely popular. Two days later on June 23, she engaged two Indian Muslims as waiters, one of whom was Abdul Karim. He was soon promoted to “Munshi”: teaching her Urdu (known as Hindustani) and acting as a clerk. Her family and retainers were appalled, and accused Abdul Karim of spying for the Muslim Patriotic League, and biasing the Queen against the Hindus. Equerry Frederick Ponsonby (the son of Sir Henry) discovered that the Munshi had lied about his parentage, and reported to Lord Elgin, Viceroy of India, “the Munshi occupies very much the same position as John Brown used to do.” Victoria dismissed their complaints as racial prejudice. Abdul Karim remained in her service until he returned to India with a pension, on her death. On September 23, 1896, Victoria surpassed her grandfather George III as the longest-reigning monarch in English, Scottish, and British history. The Queen requested that any special celebrations be delayed until 1897, to coincide with her Diamond Jubilee, which was made a festival of the British Empire at the suggestion of Colonial Secretary Joseph Chamberlain. The prime ministers of all the self-governing dominions were invited to London for the festivities. One reason for including the prime ministers of the dominions and excluding foreign heads of state was to avoid having to invite Victoria’s grandson, Wilhelm II of Germany who, it was feared, might cause trouble at the event. The Queen’s Diamond Jubilee procession on June 22, 1897 followed a route six miles long through London and included troops from all over the empire. The procession paused for an open-air service of thanksgiving held outside St. Paul’s Cathedral, throughout which Victoria sat in her open carriage, to avoid her having to climb the steps to enter the building. The celebration was marked by vast crowds of spectators and great outpourings of affection for the 78-year-old Queen. With a reign of 63 years, seven months and two days, Victoria was the longest-reigning British monarch and the longest-reigning queen regnant in world history until her great-great-granddaughter Elizabeth II surpassed her on September 9, 2015. Victoria’s links with Europe’s royal families earned her the nickname “the grandmother of Europe”. Victoria and Albert had 42 grandchildren, of whom 34 survived to adulthood. Their descendants include Elizabeth II, Prince Philip, Duke of Edinburgh, Harald V of Norway, Carl XVI Gustaf of Sweden, Margrethe II of Denmark, and Felipe VI of Spain. For more information on Queen Victoria’s life, before and after her wedding, please see my previous article on A Stamp A Day. The silk satin wedding dress worn by Queen Victoria in 1840, when she married Albert Saxe-Coburg, is prepared by a conservator for conservation work to begin. Throughout her long life following her marriage, Victoria remained proud of her bridal gown. She revisited the lace-makers to create the christening gown worn by her children, including Albert Edward, the future Edward VII. This gown was worn for the christening of all subsequent Royal babies until the baptism of James, Viscount Severn in 2008, when a replica was used for the first time. As a mark of support for the Honiton industry, in addition to often wearing their lace on her and her children’s clothes, Victoria insisted her daughters also order Honiton lace for their wedding dresses. 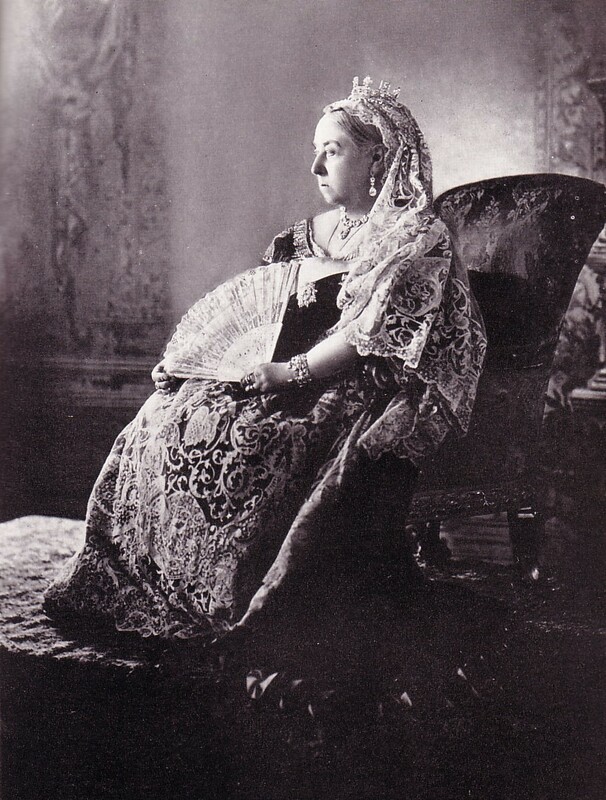 Victoria also wore her wedding lace mounted on the dresses she wore to the christenings of her nine children (except for Albert Edward’s, for which she wore her Garter robes). She also wore it to the weddings of two of her children, her eldest daughter, Victoria, in 1858, and her youngest son, Leopold, in 1882. Her youngest daughter, Princess Beatrice, was permitted to wear it as part of her wedding gown in 1885. Victoria also wore the lace to the wedding of her grandson George (the future George V) to Mary of Teck in 1893. 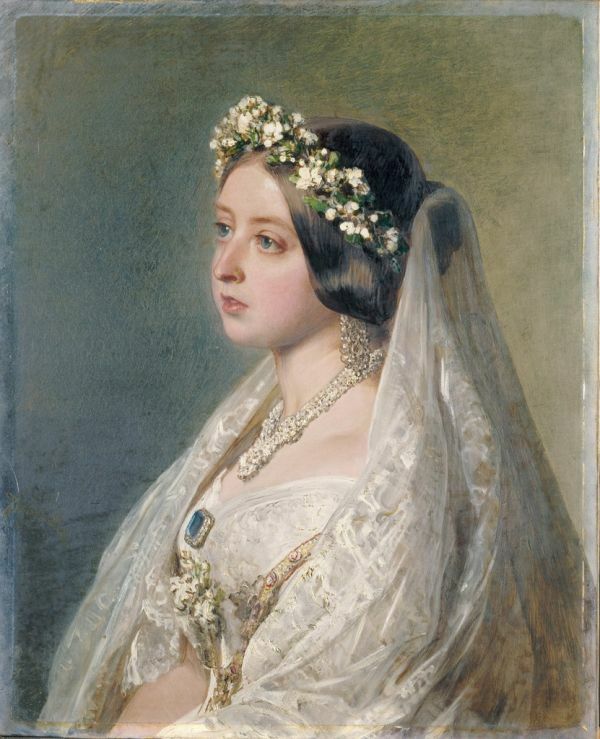 When Victoria died, she was buried with her wedding veil over her face. In 2012, it was reported that while the dress itself had been conserved and displayed at Kensington Palace that year, the lace was now too fragile to move from storage. Queen Victoria wore her wedding veil and lace for her Diamond Jubilee official portrait by the Queen’s Photographers W & D Downey. The famous photograph was deliberately not registered for copyright, ensuring that it would be distributed throughout the empire and used on thousands of commemorative souvenirs. Although the photograph was issued for the jubilee of 1897, it was actually taken in 1893 on the occasion of the wedding of Prince George, Duke of York (the future King George V) and Princess Mary of Teck. It is this photograph that comprises the central design of Canada’s definitive stamps released between 1897 and 1902 which are known as the “Maple Leaf” issue, which were printed by the American Bank Note Company. While similar in appearance, the portrait of the elderly Victoria used alongside the “young Queen” Chalon vignette on the 11-stamp Jubilee set of 1897 (Scott #50-65) is actually based on a photograph by Alexander Bassano in 1887. The first set of stamps contained maple leafs in each corner (Scott #66-73) but this design was in use for only a few months before being replaced by a modified design that replaced the lower leaves with numerals of value, motivated by the French-speaking population who found it difficult to read the textual denomination on the original design. They continued to be issued until 1902 and were replaced by the first Edward VII stamps the following year. 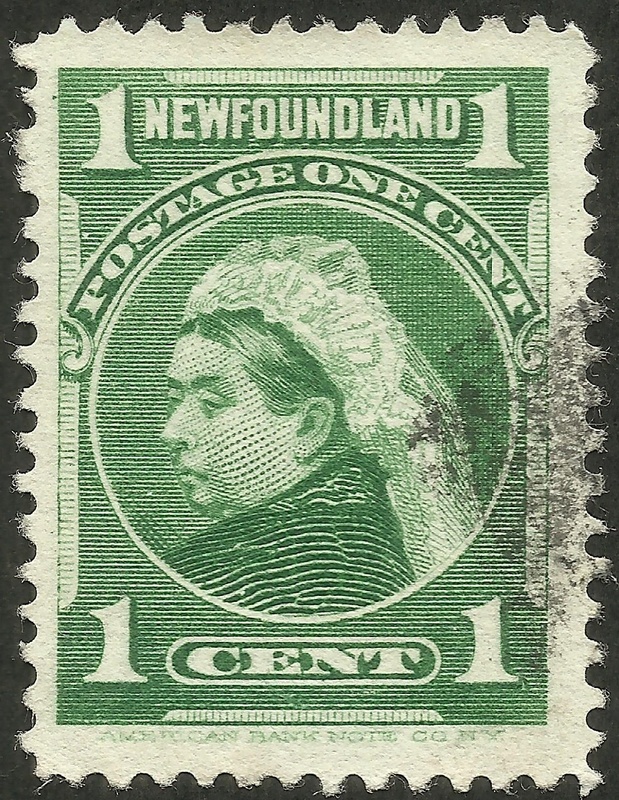 The Canadian Province of Newfoundland also released stamps picturing the elderly Queen wearing her bridal veil in several stamps beginning with a right-facing portrait that first appeared in 1877. A left-facing three-quarters image was first used on the lowest denomination of Newfoundland’s own 1897 Jubilee set (Scott #61), designed by R.O. Smith and printed by the American Bank Note Company. The design was used again later that year on a very similar one-cent in carmine rose (Scott #79) but with the portrait larger due to the removal of the Queen’s Jubilee inscription and other design differences. This was reprinted in yellow-green in six months later in June 1898 (Scott #80). These were part of a definitive set which featured portraits of the Royal Family including the first ever of Prince Edward, the future Duke of Windsor, as a baby. They were issued between 1897-1901. 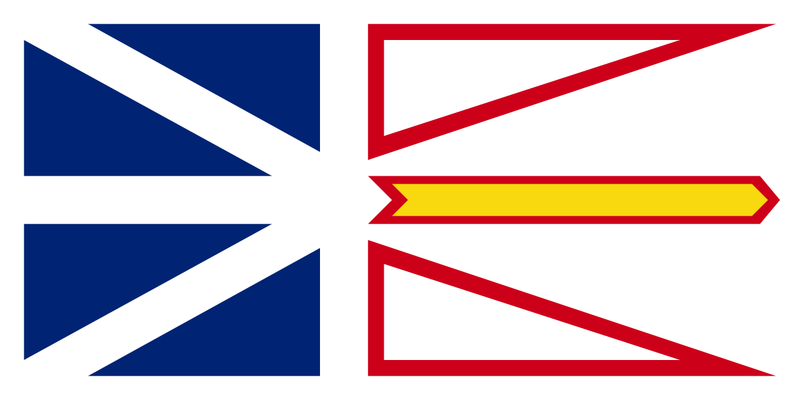 Please see my previous article about Newfoundland for more about the dominion and provincial history, as well as information about its very interesting stamps.